Discover barefoot luxury at the award-winning Conrad Rangali Island Maldives resort, set on two private islands offering beach and water villas among miles of idyllic white-sand beach and unspoilt reef. Photo copyright Conrad Maldives Rangali. 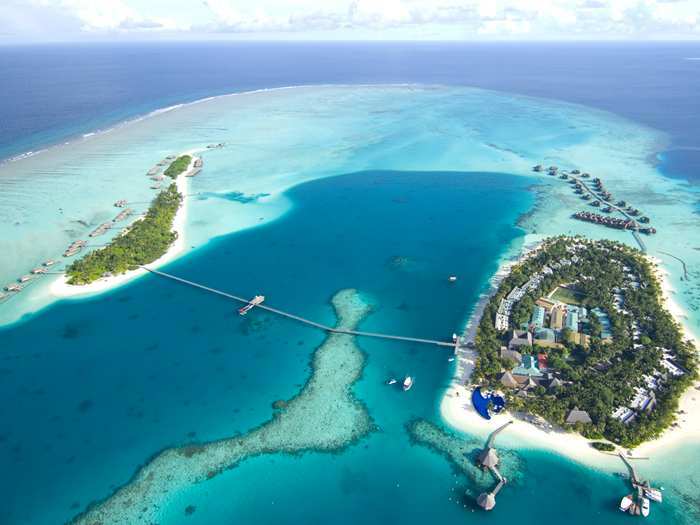 The 5-star Conrad Maldives Rangali Island is a combination of three distinct resort experiences on two islands surrounded by a coral reef and lagoon. It's also home to two spas, seven restaurants - including the world's only all-glass undersea restaurant - and three bars, as well as kilometers of white sand beaches, outstanding diving and snorkeling, and a wealth of other sports. Conrad Maldives Rangali Island combines exceptional services and amenities with world-class hospitality in one of the world's most beautiful locations. Food lovers and wine connoisseurs will love the seven outstanding restaurants and four bars set in spectacular Maldivian beach settings and the unique dining experience of the world's first all-glass undersea restaurant, the Ithaa, 16 feet below sea level. The Atoll Market restaurant serves world cuisine from eight international kitchens. Choose the Koko Grill Restaurant for a nine-course Japanese feast. Fine wines await discovery six feet underwater in The Wine Cellar serving degustation wine dinners. Book a private beach dinner with your own chef and waiter or a sensational beachside feast with fresh lobsters and champagne. Indulge in spa therapies at the two stunning spas on stilts over the Indian Ocean offering luxury treatments in glass-floored treatment rooms. Exercise in the fully equipped fitness center. Swim in the two infinite view swimming pools and play tennis by the ocean. Do business in the 24-hour business center. Spectacular scenery makes this resort the perfect location for weddings and honeymoons. Buy something special in the resort's three boutiques offering Italian designer wear, jewellery and gift items. This amazing resort has a Dive Center and Watersports Center and a "Nemo" style mini submarine to take two passengers on a 30-minute ride of a lifetime to see the resort's coral reef.